A FIB, when scanned over a given area, modifies a sample in different ways, depending on the energy of the incoming ions (see figure 1, left column). In the 5 to 30 keV energy range, the exposed area is etched away as a consequence of mechanical collisions between ions and atoms from the sample (figure 1a). Higher energies (> 50keV) are used to implant the focused beam ions in the sample (figure 1b), whereas low energies (some eV) lead to a deposition of the ions on the sample (figure 1c). As for a focused electron beam, it cannot provide a direct mechanical machining on its own like a FIB. Charged particles interactions with a sample surface can be modified when reacting molecules are introduced as gas thanks to an injection system (GIS for Gas Injection system) in the working area. 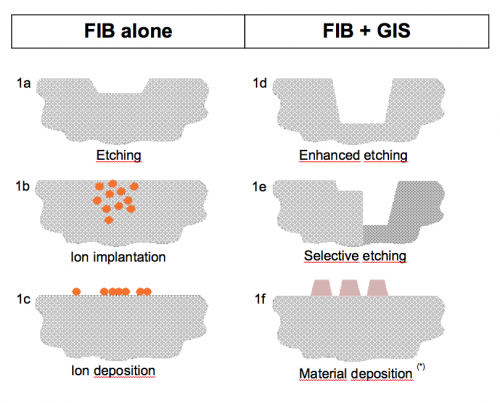 Focused ion and electron beams can both be used for high resolution deposition processes (named as FIBID and FEBID). The basic principle of this method is the introduction of a vapor containing some suitable chemical form of the desired material into the sample chamber. Molecules from the gas are adsorbed at the surface due to Van Der Waal’s forces. The energy brought by the beam then dissociate these molecules modifying the scanned area. It is generally accepted that the secondary electrons produced by the collision of the ions or primary electrons with surface atoms are involved in the cracking of the adsorbed precursor molecules. These secondary electrons possess low energy (< 50 eV) comparable to the classical molecules bond energies responsible of the cracking of the precursor or the formation of bonds between chemicals and surface atoms. The most obvious difference between Ion Beam Induced Deposition (IBID) and Electron Beam Induced Deposition (EBID) is the speed of deposition at a given beam current. The ion beam deposition is much faster than deposition with the electron beam. This is primarily due to the more important number of secondary electrons produced by ion beam when colliding the sample compared to an electron beam. The secondary electron yield of the electron beam can be increased by lowering the accelerating voltage but, in general, for standard beam energy (30 keV for a FIB and 5 keV for a FEB) at a given beam current, the electron beam deposition remains significantly slower than with the ion beam. Two main reaction are generally observed when introducing chemical molecules: surface etching modification or material deposition. With a reactive gas, the mechanical etching due to the focused beam can be enhanced or reduced due to local chemical reactions. On one hand, when volatiles species are formed, the sputtering rate is increased and less material redeposition is observed (figure 1d). On the other hand, harder layers can also be created by precursor surface absorption and a diminution of the sputtering rate is observed. Such amplified variations of the sputtering rate are used to perform selective etching or homogeneous surface delayering. An example of the depassivation of an integrated circuit where the top insulator is etched while the metal lines are entirely preserved is presented on figure 1e. The use of a plasma source for the focused ion beam such as with an i-FIB column allows to achieve a maximum ion current an so increasing removal rates of material. Compared to FIB technologies with standard LMIS sources (such as ORAGE or COBRA), the material removal rate achievable for silicon with the Plasma source FIB is over 50x faster. Coupling chemistry and plasma columns is the insurance to reach the best etching rate for all your applications. With some other gases, the decomposition of the adsorbed molecules by FIB or SEM results in a local deposition of material. The secondary electrons will break chemical bounds of the adsorbed molecules and dissociate the initial precursor into different components: volatile ones pumped away from the chamber and others bonding with the sample to generate surface deposition. If the FIB beam sits too long on the same location or if the currents is too high, the freshly deposited material can be milled away. In order to keep a good deposition yield, the gas needs to be replenished continuously in the working area. For this reason, the beam scans an area and once it has dissociated much of the adsorbed gas, it moves to another location before coming back to the same point. The time between two subsequent "visits" is called the refresh time. Once absorbed gas replenishment of the surface if performed, the beam can return to the same point and then increase the deposition thickness. A suitable precursor makes possible to build microstructures from various materials (figure 1f). Even if chemistry GIS enhanced etching and material deposition are performed using precise working parameters for both injected gases (injection pressure, purity) and the focused ion or electron beam (beam current, scanning signals).